MELT is a unique formulation of calcium chloride crystals that are super-enhanced with extenders for long-lasting traction control. MELT is designed to quickly, safely and effectively tackle frozen snow, sleet and ice around your property during the winter season. Packaged in a convenient dispenser jug, MELT can be conveniently dispensed directly out of the jug and onto the surface to be de-iced. Proven safe when applied to quality concrete surfaces, MELT exhibits the following properties: MELTS DOWN TO -25F: MELT calcium chloride crystals effectively melt ice and snow on contact, even at temperatures as low as -25F. INSTANT HEAT: MELT calcium chloride crystals generate heat instantly upon contact with snow and ice, thereby accelerating the melting process. FAST ACTING: MELT calcium chloride crystals are specially formulated with super-enhanced melting properties to deliver fast and reliable results. Time to toss out the old shovels; backbreaking winter-weather cleanups are a thing of the past with the Snow Joe SJ-SHLV01 Shovelution Back-Saving Snow Shovel - the next generation in snow-clearing technology. Snow Joe's back saving solution greatly reduces the effort, strain and potential injury involved in shovelling, using the powerful muscles of your upper body to do the lifting and throwing, and sending lifting leverage to the lower hand - to reduce back strain by up to 30%. Plus, Snow Joe's spring-loaded, ergonomic shovel grip captures the expended energy from the act of throwing the snow, to quickly return and reset the shovel, ready for the next load. MELT 25 Lb. Resealable Bag Calcium Chloride Crystals Ice Melter MELT is a unique formulation of calcium chloride crystals that are super-enhanced with extenders for long-lasting traction control. MELT is designed to quickly, safely and effectively tackle frozen snow, sleet and ice around your property during the winter season. Packaged in a convenient dispenser jug, MELT can be conveniently dispensed directly out of the jug and onto the surface to be de-iced. Proven safe when applied to quality concrete surfaces, MELT exhibits the following properties: MELTS DOWN TO -25F: MELT calcium chloride crystals effectively melt ice and snow on contact, even at temperatures as low as -25F. INSTANT HEAT: MELT calcium chloride crystals generate heat instantly upon contact with snow and ice, thereby accelerating the melting process. FAST ACTING: MELT calcium chloride crystals are specially formulated with super-enhanced melting properties to deliver fast and reliable results. MELT 25 Lb. 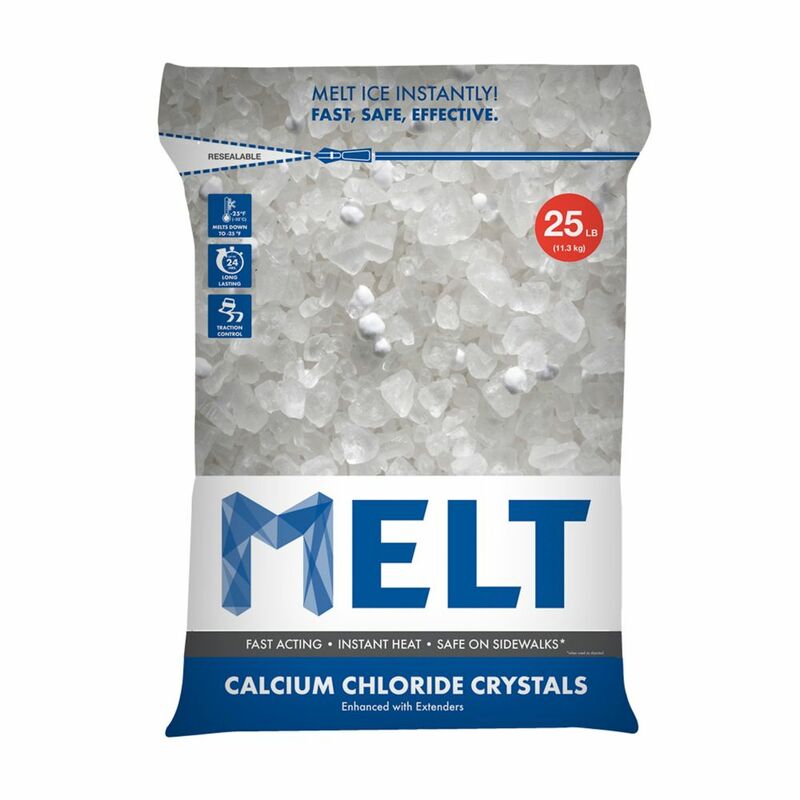 Resealable Bag Calcium Chloride Crystals Ice Melter is rated 4.6 out of 5 by 20. Rated 4 out of 5 by Gary from Did exactly what I expected. I should have bought... Did exactly what I expected. I should have bought a bigger bag. Nearly out already. Rated 5 out of 5 by Bill from Easy to handle,works fast and lasts pretty long ! Doesn't damage wood and asphalt or cement areas ! Easy to handle,works fast and lasts pretty long ! Doesn't damage wood and asphalt or cement areas ! Rated 5 out of 5 by Nancy from This snow melt works very quickly and does not ruin... This snow melt works very quickly and does not ruin the concrete. It’s the only one I use. Rated 4 out of 5 by Embury from Works well - needs to be in a tightly closed... Works well - needs to be in a tightly closed container or will clump. Rated 5 out of 5 by Robert from Worked for a long time!... Worked for a long time! Rated 5 out of 5 by Barbara from there's nothing like having a heavy package delivered directly to... there's nothing like having a heavy package delivered directly to your door. this is my second order of ice melt, hopefully it will stop snowing and I won't have to use it all. since my driveway is on a slope, I have to keep it clear of ice. this product works well. Rated 5 out of 5 by Tony from Works great the Best Buy for the money .... Works great the Best Buy for the money .